In a food processor add dates and process until it is a paste. Add coconut, cinnamon, cocoa and sea salt and pulse to combine, scraping down sides as needed. If too sticky add additional coconut one tablespoon at a time. Add dried cherries- pulse just enough to mix them in. Line a dish or baking sheet with parchment paper, scoop out mixture and evenly flatten mixture with clean hands or spoon. Refrigerate for 30 minutes. Pop parchment paper with mixture out and place on cutting board. Then using a sharp knife cut into 20 bars. Roll the soft bars into balls, and coat each ball in sunflower seeds or shredded coconut. 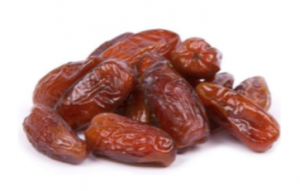 Dates grow in trees in regions with HOT long summers- they grow best when there are over 100 days of 100-degree weather!